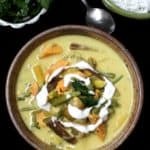 This South Indian Vegetable Curry from the spice coast of Kerala in India is quite authentic, but it's also an easy recipe to put together for a quick weeknight meal. Mixed vegetables are cooked to tenderness and drowned in a sauce of coconut milk and a few simple spices. A vegan, gluten-free, soy-free and nut-free recipe. Place all the cut veggies into a large pot with 1 cup of water and turmeric. Place the coconut milk in the blender with the cumin, green chili peppers, and bengal gram dal or rice. Blend into a paste. Set aside. When the veggies are cooked -- it should take no more than 15-20 minutes -- add the coconut paste to the veggies and stir well to mix. Let the curry come to a gentle boil over medium-low heat. Turn off the heat and add the yogurt or lime juice. Stir to mix but be careful not to mash up the veggies because they'll be very tender at this stage. Heat the coconut oil. Add mustard seeds and when they sputter, add the curry leaves and the ginger. Saute for a minute or two until the fragrance permeates the house. Pour the tempering over the avial and stir to mix. Garnish, if you wish, with coriander and some fresh coconut.